Many times when I want to try something experimental in my fashion, I like to start with something I’m not as completely invested in as a sewn ‘from-scratch’ garment. Therefore, if I don’t find something unwanted from my existing wardrobe, I often resort to re-sale and thrift store offerings. They are low-cost, there are a plethora to choose from, and I feel like I need to do my part in making a dent with the unwanted and uninteresting leftovers from our modern fast fashion industry. 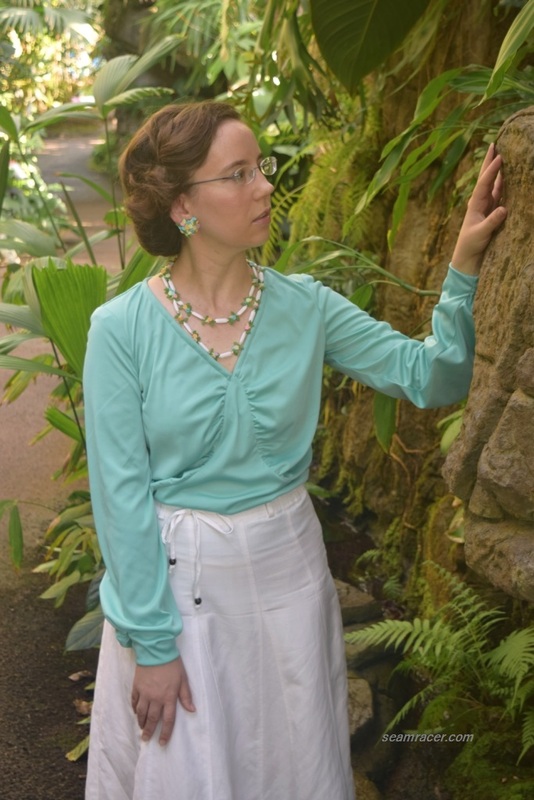 Here is my latest re-fashion attempt, made for a special family occasion. 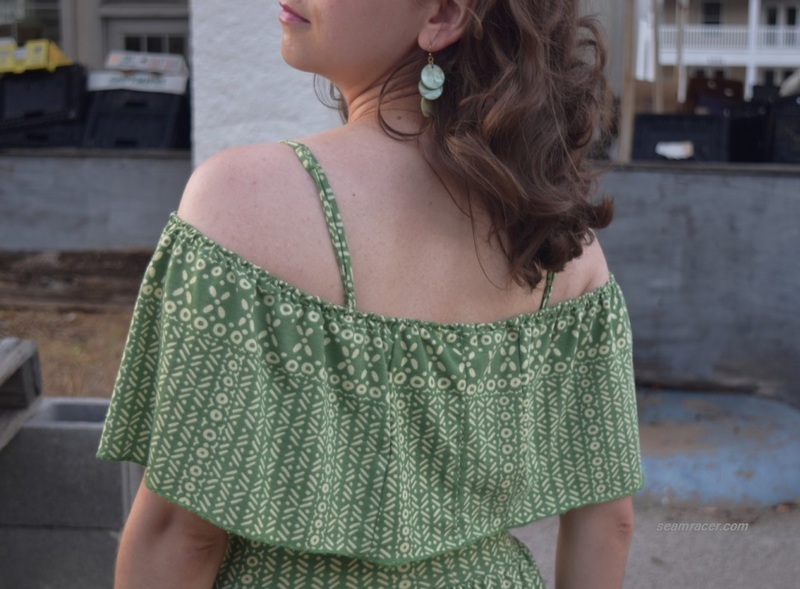 As a frequent vintage wearer, I am rather surprised how taken I am by this…it makes me feel so on trend with all the latest off-the-shoulder looks this summer! 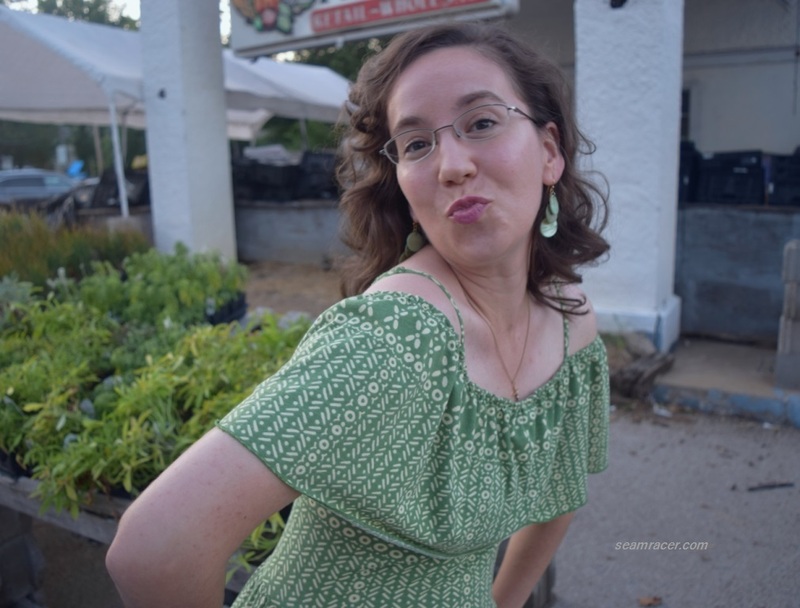 My husband actually thinks it reminds him of the character Naomi from the television series “Mama’s Family”, although my dress is green and not her favorite shade of yellow. For some reason, this attribution to Naomi makes me sigh, half-smile, and feel ever so slighted even though I know she was a great character in her own right. 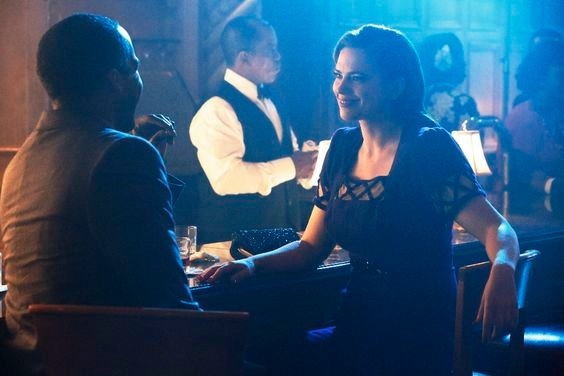 Hubby is right, though, this is something she would totally wear! I mean, she even wore an off-the-shoulder dress for her wedding to Vint! 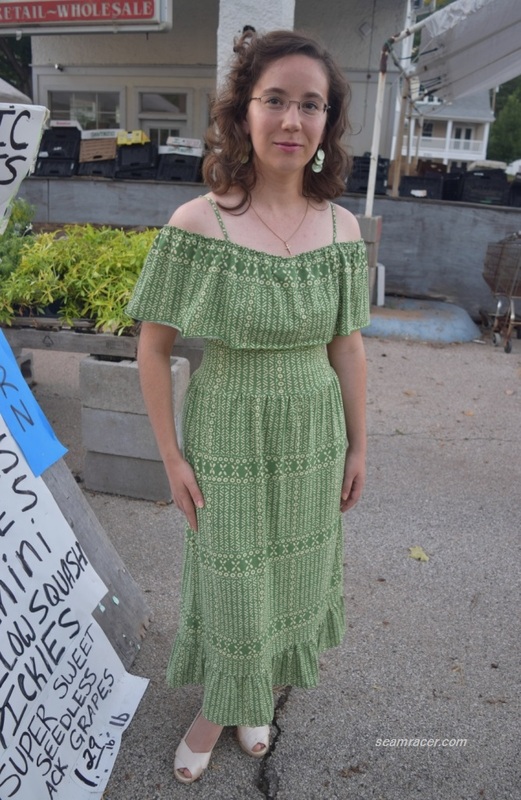 Yet, do I think this dress reminds me of the peasant and hippie styles of the 1970s and 80’s especially with the hem ruffle, but maybe it’s the vintage lover in me which only wants to find a past decade to associate with. 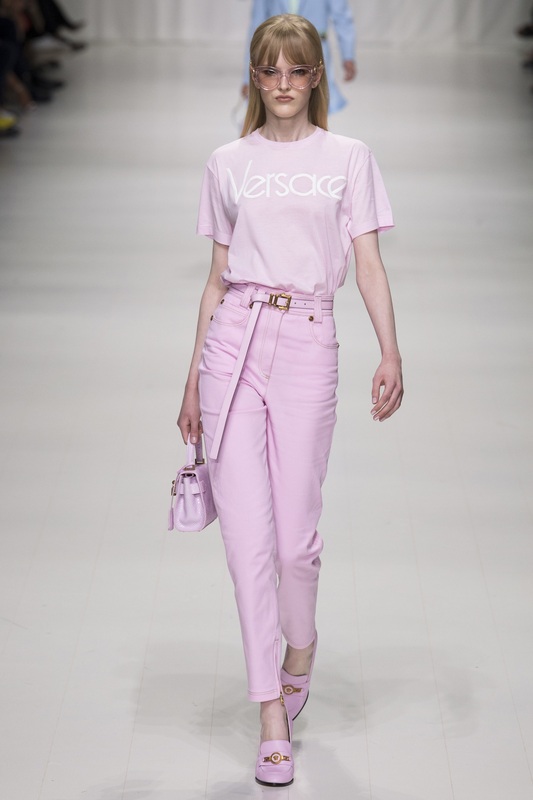 I have a whole Pinterest board dedicated to peek-a-boo shouldered garments, starting from the late 20’s ‘til now, as well as a board for the Peasant look, if you’re interested in looking at more past twists on this modern trend. 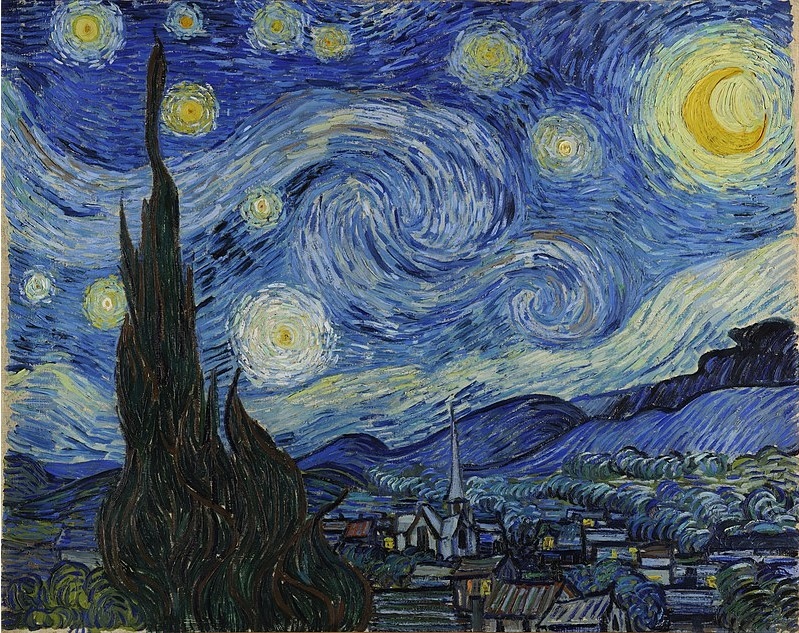 PATTERN: none – this was all my own inspiration! TIME TO COMPLETE: Making this dress took me about 2 or 3 hours and it was finished on July 5, 2017. THE INSIDES: cleanly overlocked (serged)…more on this below. I have been waiting for the perfect re-fashion idea to hit my mind for the few years since I bought this dress. After simmering on the back burner of my projects list, it was only recently that I suddenly came up with this idea which felt ‘right’. I went with it (as you can see), and was so pumped to dive in that a picture of the original sundress was forgotten before it became re-fashioned. Oh well – it was very boring and basic after all. The original dress was just an empire, under bust sundress with spaghetti straps and very long skirt which had two ruffles at the bottom hem. There were inseam pockets – one on each side – at a very awkward, low hip spot. 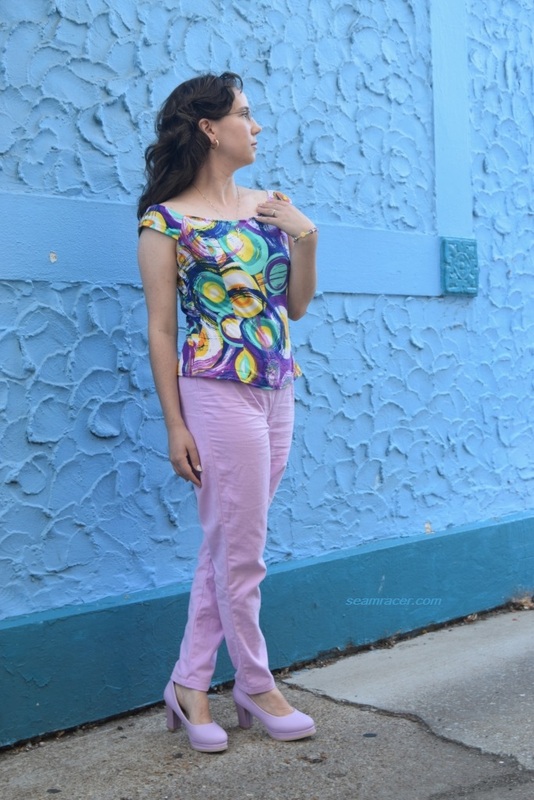 It was pretty much shapeless and uncomplimentary, but the fabric is a wonderful rayon knit with a nice color and print, so I figured it was worth saving. My first step was to cut off the bottom of the two large hem ruffles. Most of this became the shoulder ruffle. 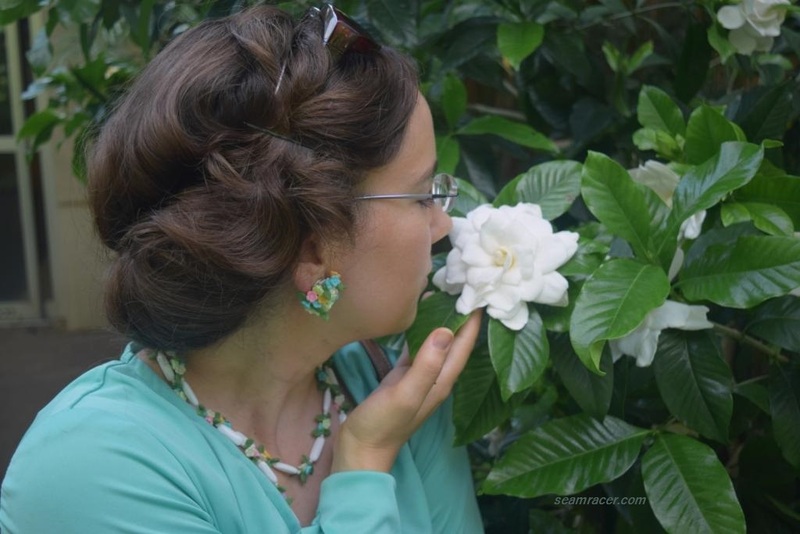 I couldn’t have asked for an easier refashion here – I kept the gathers at the top of the ruffle when I cut it off, so all I had to do was hand tack it to the spaghetti straps and the neckline front and back centers. There was just enough left over from the shoulder ruffle to make a new, wide, middle body waist band so I could have more shaping than just the high empire seam (which gets covered by the ruffle anyway). 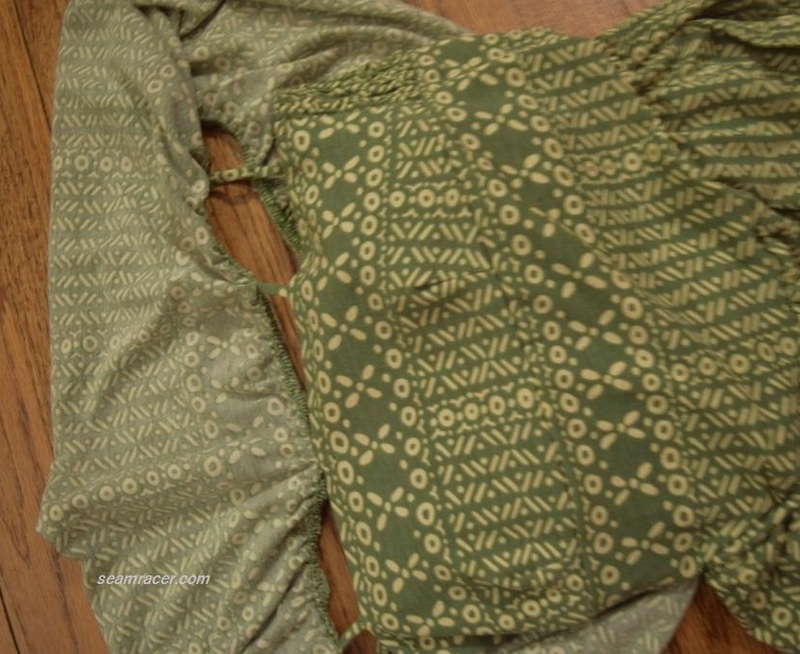 The skirt was cut off at the empire seam and my new middle waist panel was sewn in there instead. It extends down to my natural waistline so the skirt could be re-sewn on at that point. I did cut off an extra several inches from the top of the skirt portion, just so the inseam side pockets could be at a natural height for my hands at mid-hip. Next, this was stretched while sewn onto the bottom waist seam of the middle body panel, giving the dress a nicely controlled and loosely gathered skirt. 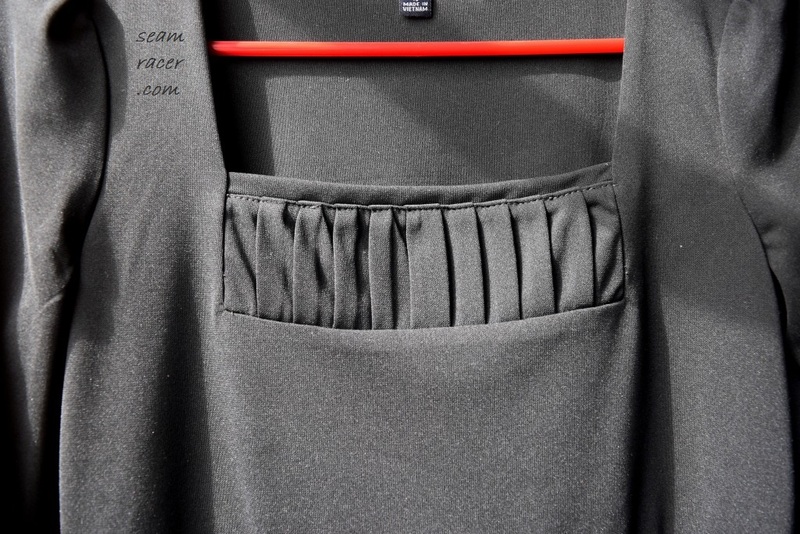 As this is a ready-to-wear item originally, I departed from my normal dislike of serging (overlocking) seams and thought I would give it a go again just to match with the rest of the finishing inside the dress. This is a knit so I figured I probably would not need to really change, adjust, or otherwise tailor this too much in the future…but hey, this was cheap enough to buy and no skin off my back if it didn’t turn out. Since I do not have a serger, I made a visit to my wonderful neighborhood sewing room. It’s a place equipped with every sort of machine, notion, fabric, pattern or necessary supply I could ever want sewing-wise and the best creative, happy, and friendly atmosphere one could ask for…with a kitchen and wash room to boot. I pay a ‘per hour’ rate and get sewing done while relaxing and enjoying the company of interesting, fellow sewing enthusiasts. 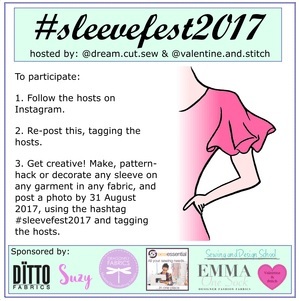 There are many such places popping up all over – I suggest you search and see if there is something like this in your town…if there is, please support it; if not at least do what you can to connect with other sewing friends! Apart from my diversion in topic, I now had the perfect reason to spend more time at my local city sewing room, and used the sergers and large cutting tables there to make and finish my dress. I totally had much more fun making this dress than it is to wear it. 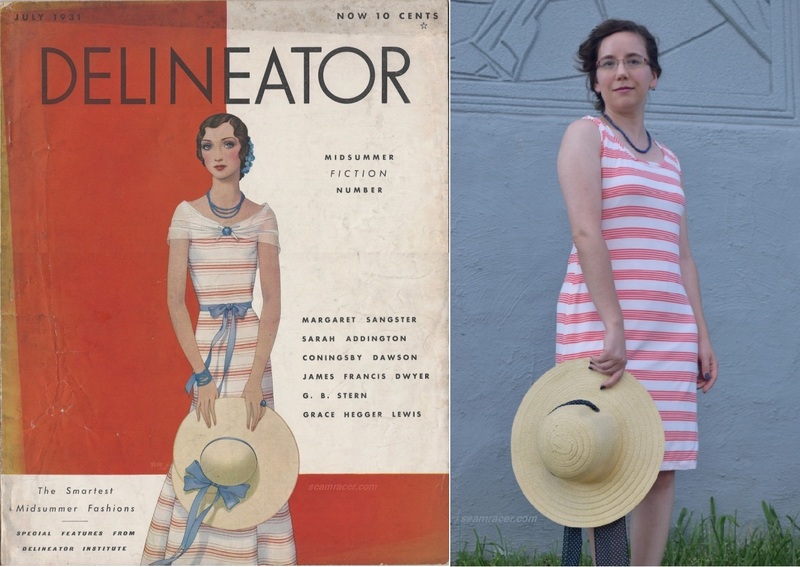 What happens when I want to imitate the cover of a vintage Delineator magazine I own, but I only have one measly yard of matching fabric to work with? 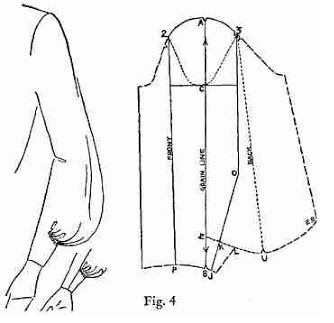 This…I become a modernly basic version of a year 1931 Delineator girl. I’ve made vintage fashion up-to-date before, but never to this point. I’ve also never used stripes in the sometimes uncomplimentary horizontal direction before, and I am still being won over to the result. 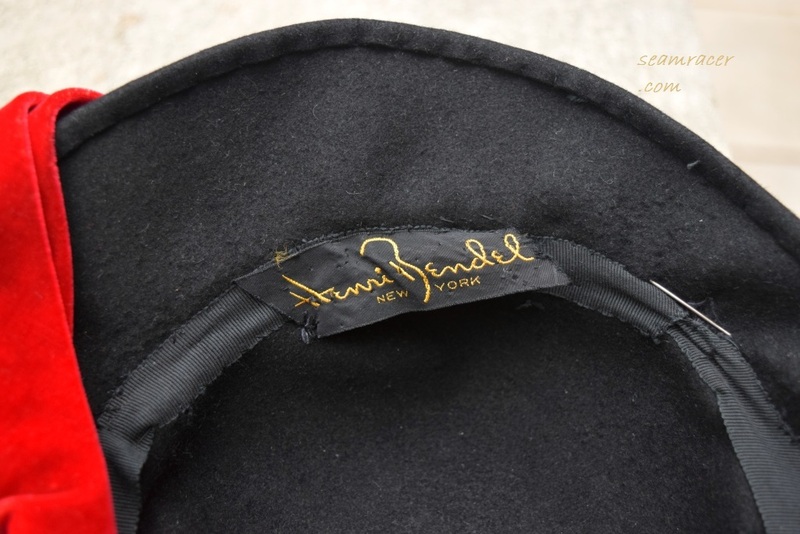 Nevertheless, this is comfy to wear, cool for summer, and as easy to sew up as it is to accessorize. This dress was made so I could have a patriotic set for Independence Day as part of the “4th of July Proud Dress Project” sponsored by the blog “Akram’s Ideas”. 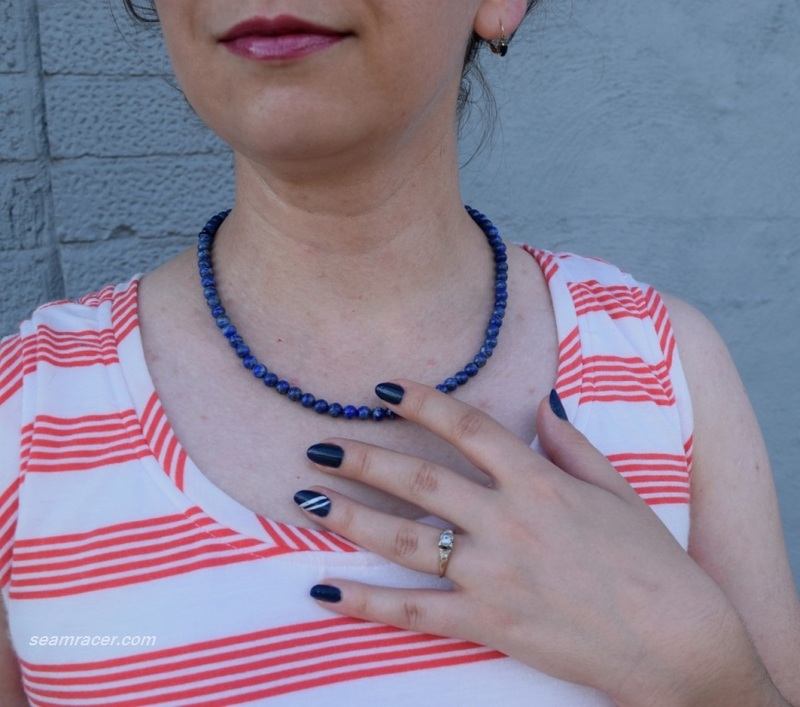 It was worn with my handmade necklace of Lapis Lazuli beads, blue sapphire earrings, and my own navy nail art for a full American color combo – complete with sun hat! Unfortunately, temperatures were lower than normal and a bit too chilly for me to be completely comfortable in my dress for long, so I’m looking forward to much more use of this once the full heat of summer kicks in here…especially for those dash out of the house errands or after school pick-up occasions! NOTIONS: Nothing but white thread was needed, and of course I have plenty of that! TIME TO COMPLETE: The dress was finished on June 22, 2017 after only 4 or 5 hours. 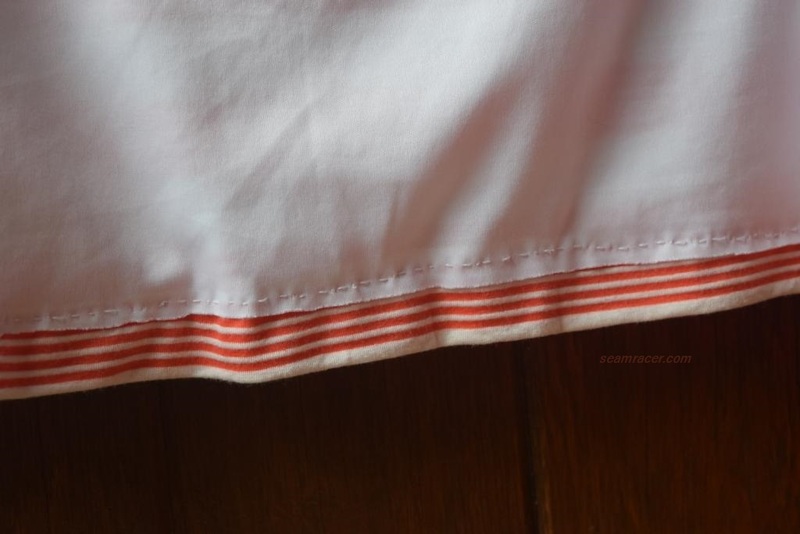 TOTAL COST: The striped rayon knit was a folded up remnant, not even on a bolt, bought when Hancock Fabrics was going out of business. Thus, I believe I bought this for about $2. 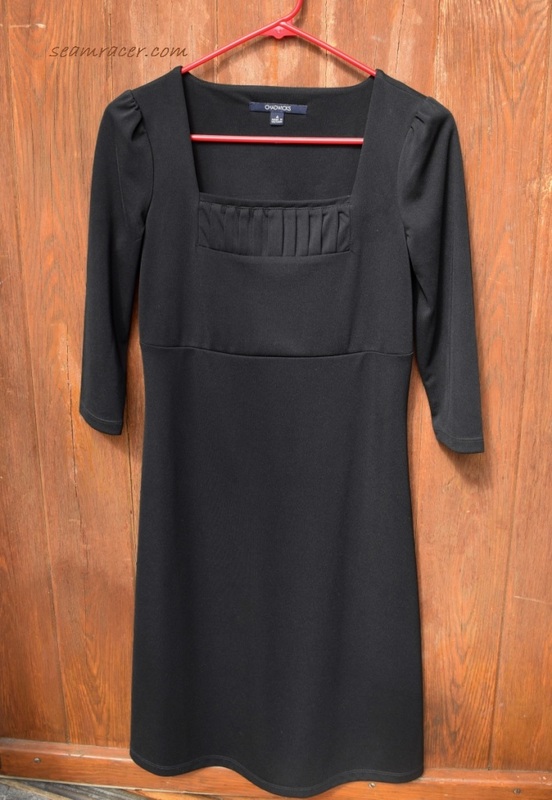 The interlock is something I have a stash of on hand, so I’m counting it as free making this one awesomely low cost yet high quality dress! 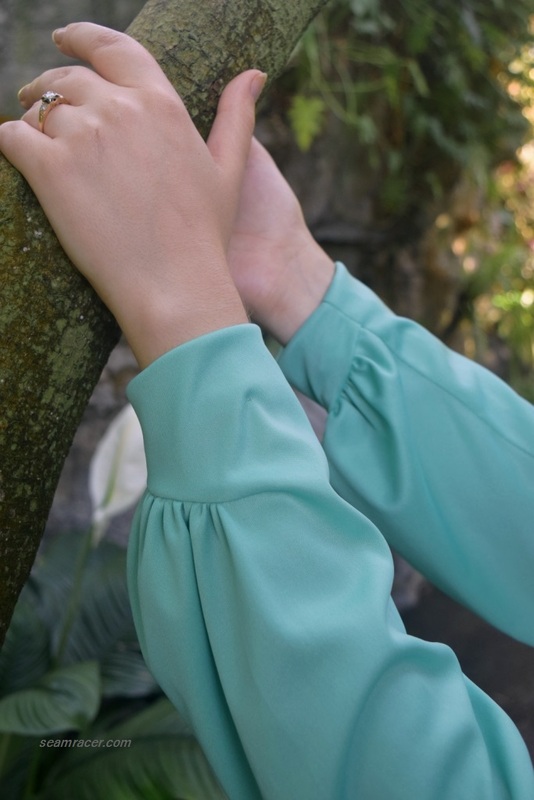 Rayon is my ultimate favorite fabric. 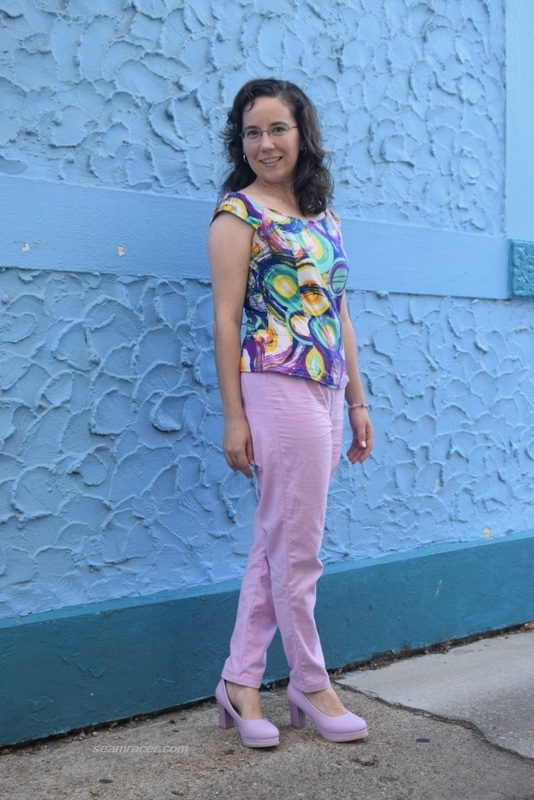 When it comes to a rayon knit, there isn’t anything more dreamy and luxurious to me. 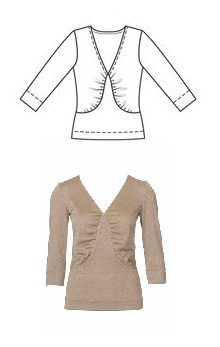 Nevertheless, rayon knit is terribly thin and delicate. Thus I figured my striped fabric, being a rayon knit, needed a lining if it was to be practical and wearable for me. 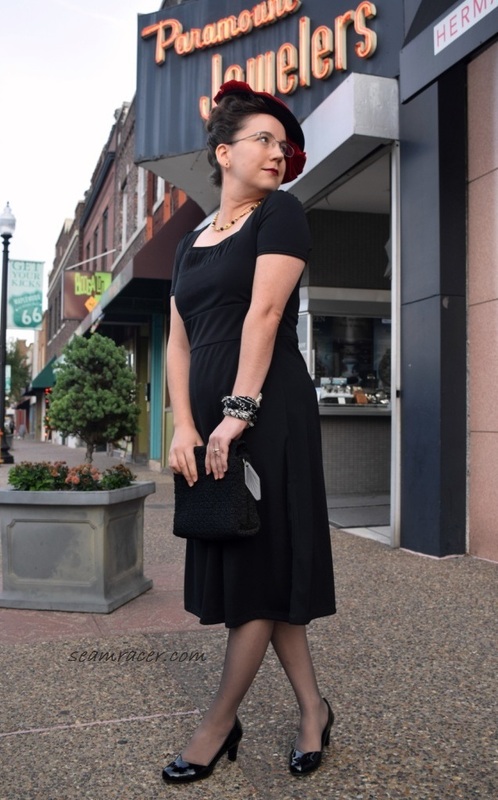 Giving this tank dress a full body lining eliminates any see-through issues, feels wonderful on the inside with no seam allowances rubbing, makes my dress a total step above any store bought tank dress, and helps keep the rayon dress in its proper shape. 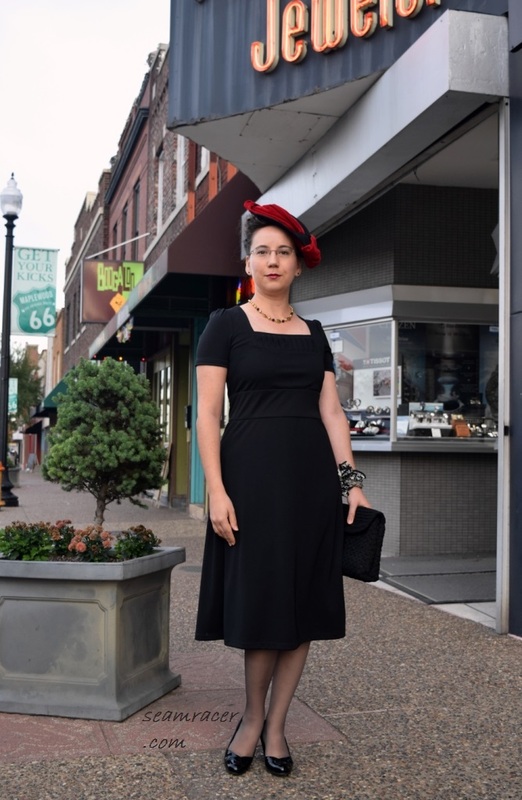 It was a win-win all around, especially since I used the lining to even cover up the hem, doing a hand-stitched finish to “make-up” for the rest of the dress’ simple design and ease in sewing. 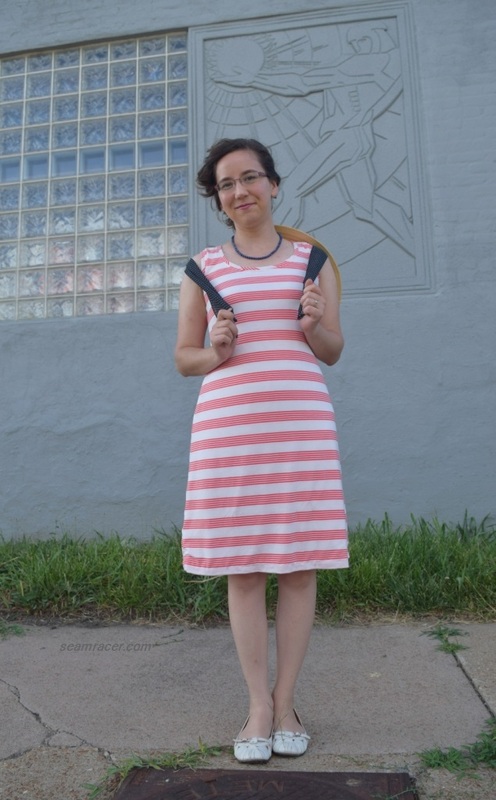 I have long been wanting to use this tank dress pattern and it pretty much sewed up to my high expectations. 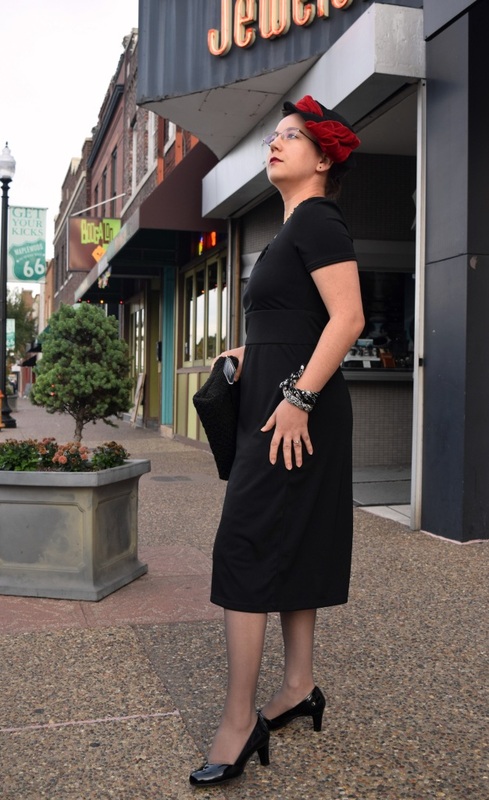 The fit is nice only because this dress’ pattern seems to run generous and I had to take it in by an extra inch or two to get a loosely close shape. The length was dictated by the amount of fabric available (not much – a 55 by 30 inch square) and so it is a tad shorter than I would like. 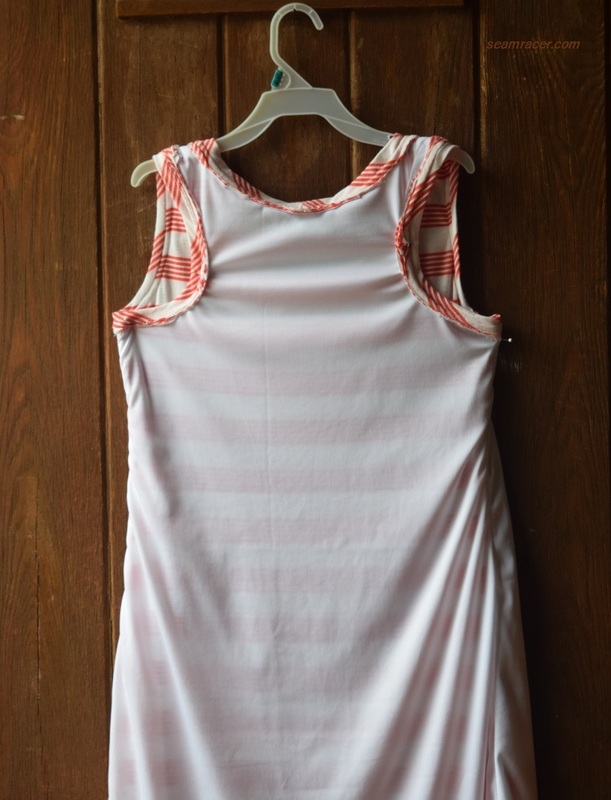 The bias binding on the armholes and neckline is interesting and was an easy and conventional means of finishing off the edges. Somehow, though, I wish I would have made it skinnier (that is, less noticeable) as well as sewing them so that they covered up the seam allowance from the inside. However, it works, and as I didn’t want to spend too much time working on such a basic dress, I’m happy with it how it is. I did choose the racer-back option, but for some reason I do not think it turned out quite as it should have. The racer-back ends up looking (to me) like a half-hearted attempt and not a full, shoulder blade baring style as I expected. I left the dress’ bodice back as it was because I do like the fact I do not have to adjust or change my lingerie strap configuration, as I would have had to do for a true racer-back. However, I think it makes me seem like I have swimmer’s shoulders from behind. I don’t swim, and although my shoulders are my strong point, I feel they are big enough and am sensitive about emphasizing them like this. Sorry, off topic! My point is, if you do want the full racer back to this pattern, I think you will have to do some re-cutting first. Here’s yet another good example of what can be done with only a yard of fabric and a vintage inspiration. Not too often do modern patterns seem to lend themselves to being a one yard friendly project – sometimes I wonder if they’re in bed with the fabric companies. 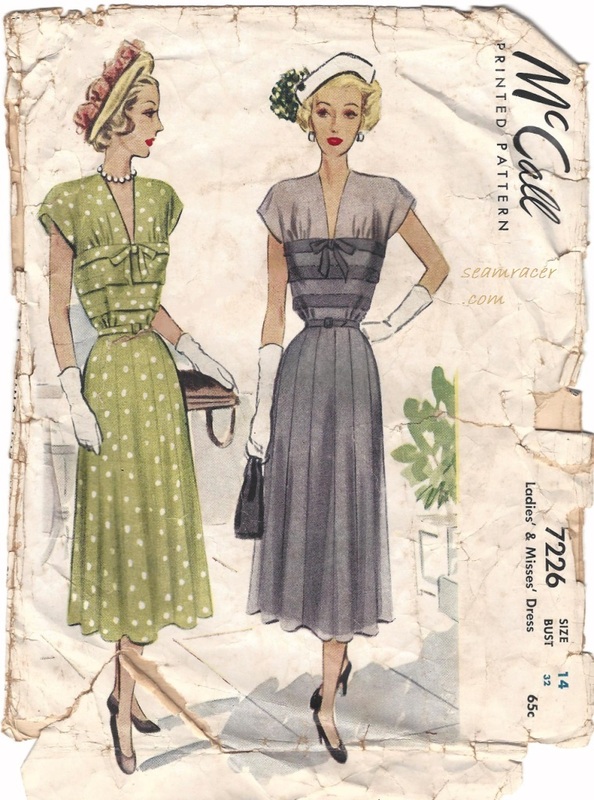 That compatibility with small cuts of material is usually something I see provided through vintage patterns. 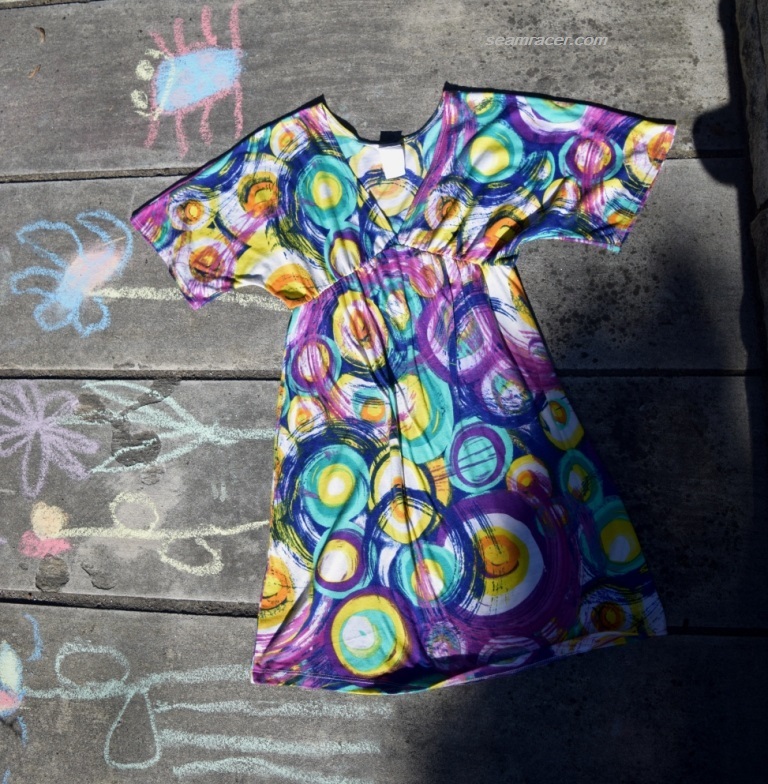 However, I hope this dress project of mine inspires you to keep your eyes open for both old and new opportunities to use those discounted small cuts, those remnants taking up room in your stash, or those pretty fabrics of second-hand clothing you no longer fit in. 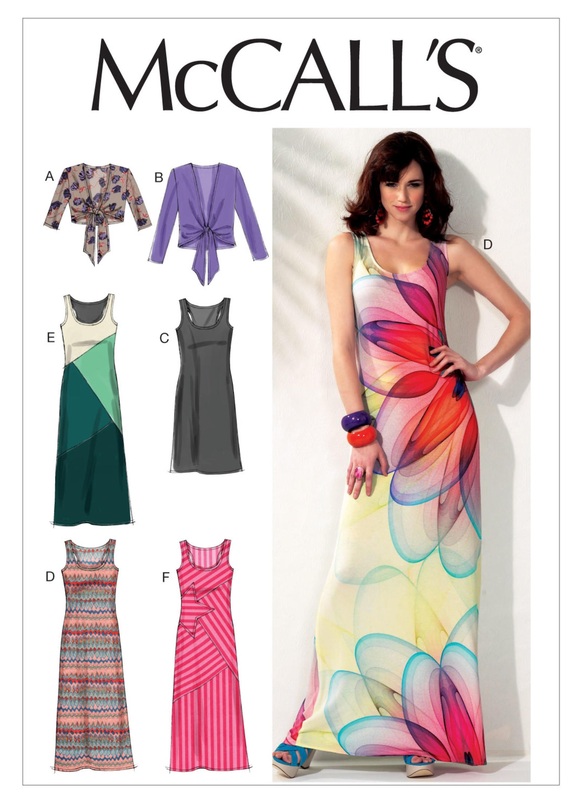 Open them up and start experimenting with the layout of some pattern pieces and you might be surprised! 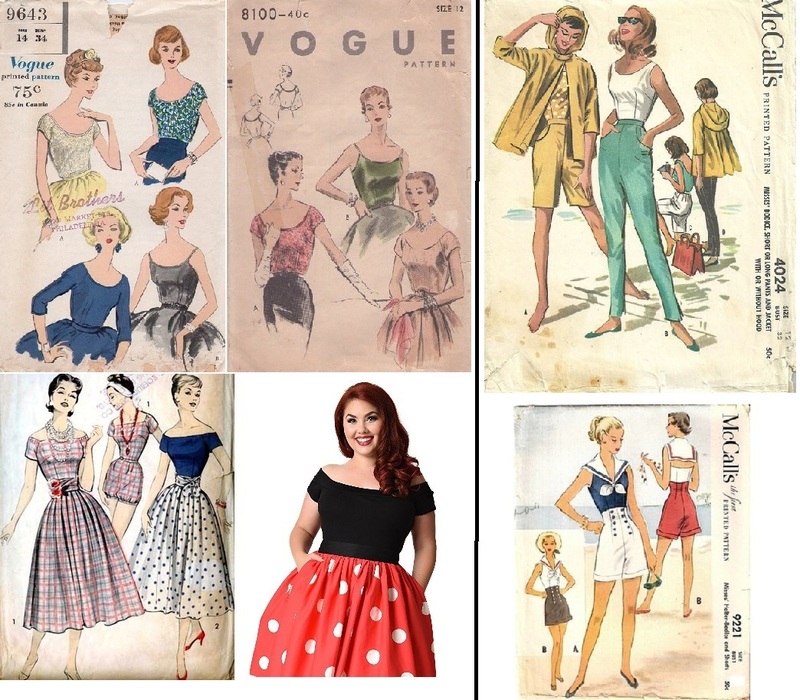 Also, just because a vintage garment or image inspires you doesn’t mean it has to translate into something old-fashioned…like my tank dress, your garment can be whatever you want it to be, for whatever occasion or era you would like! Keep being inspired and creative out there, dear readers, and happy sewing!